Apparently Sizzler has this chicken called Malibu Chicken. I found a "copycat" recipe in one of my favorite cookbooks (Favorite Family Recipes). 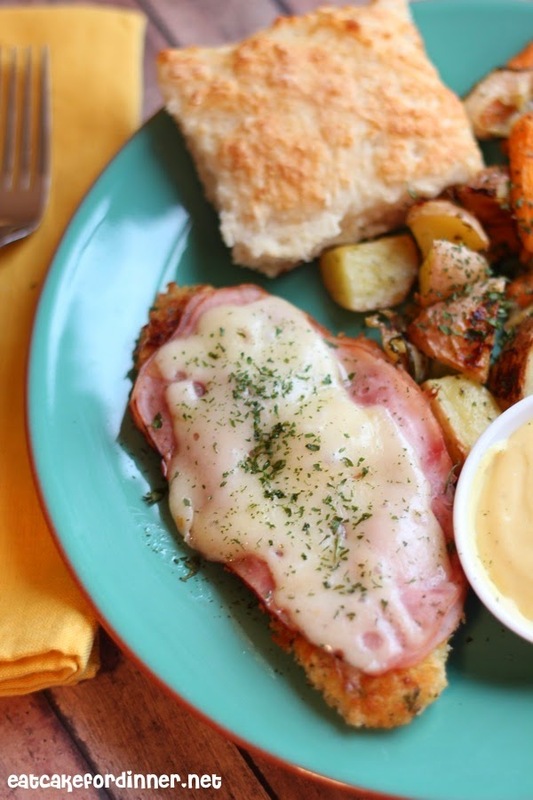 It pretty much is like a crispy, super juicy, and flavorful version of a chicken cordon bleu and it's dipped in honey mustard sauce. I, of course, had to change up the recipe to my own taste. I have no clue if it tastes anything like Sizzler's version? If you want the original recipe, click HERE to check it out. This chicken turned out darn near perfect. Every single thing about it was mouthwatering from the crunchy cheesy bread crumb crust, to the juicy chicken to the ham and melted Swiss on top. I served it alongside these Roasted Ranch Veggies and it was a meal to remember. "The Mr." kept telling me "This is SOOOOOO Good" and I couldn't agree more. Heat vegetable oil in a large cast-iron skillet over medium heat. Slice chicken breasts in half horizontally, so you have four chicken cutlets. Rub each cutlet with 1/4 teaspoon of poultry seasoning and 1/4 teaspoon of lemon pepper; set aside. Whisk the eggs in a shallow dish. Place the all-purpose flour in a separate shallow dish and combine the Panko, grated Parmesan, parsley, Johnny's Garlic seasoning and pepper to a 3rd shallow dish. Dip seasoned cutlets into the flour, then the egg and last in the Panko mixture, pressing to adhere. Place cutlets into the hot skillet. If your skillet is not large enough, you will need to cook the chicken in batches. Cook until browned, about 5 minutes. Flip and cook on the other side until browned and chicken reaches 165 degrees on an instant-read thermometer, about 5-7 minutes. Top each cutlet with a little Swiss cheese, two slices of ham each and then more cheese on top. Place skillet in a warm 350 degree oven for a few minutes or until cheese is melted. Remove from oven and serve with honey mustard. For the Honey Mustard: Stir together all ingredients. Taste and adjust as needed. Jenn's Notes: It is easiest to slice the chicken in half horizontally while they are still partially frozen. Your blog has caught our attention because of the quality of recipes. so that we could link to it. We send thousands of visitors to our blogs on a weekly basis. Everyrecipe.com.au is a search engine that compiles the best Australian cooking sites and blogs from the Internet. It is a part of an international cooking search engine MyTaste.com, which is now operating in 40 countries all over the world. Several hundred blogs are already enrolled here and are taking benefit from the traffic we are sending to their sites. This sounds so good--I'm going to give it a try tomorrow--thanks! !